Cracow, being one of the most interesting and culturally rich Polish cities, is also home to a famous contemporary art gallery “Bunkier Sztuki” (The Bunker of Arts). 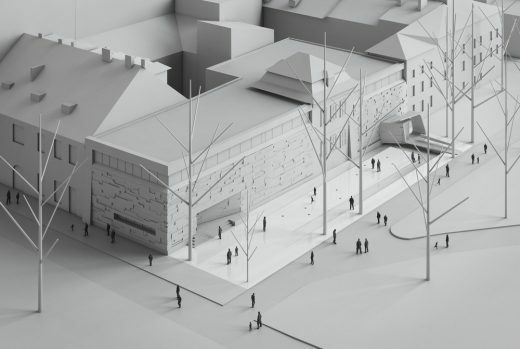 Recently, the Gallery has announced an international architectural competition aiming to find the best solution for its planned refurbishment and extension. The existing building itself is a rare treasure within the historical city centre. Its unusual form placed in the unique context of Planty Park, puts it among the most interesting of very few examples of Polish Brutalism. Over the years, original form of the building has been covered with various accretions, which have significantly changed its appearance, both inside and outside. 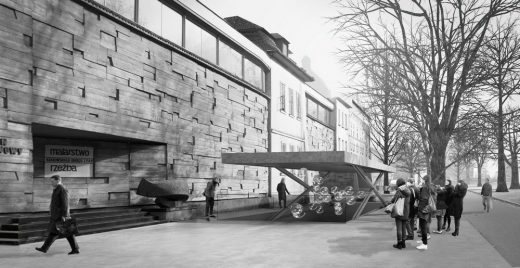 Some years ago, a tepmorary pavillion of a cafeteria has been added directly in front of the Gallery. Ment to be provisional, it has now been established as a permanent element, covering the monumental facade of ‘The Bunker’. 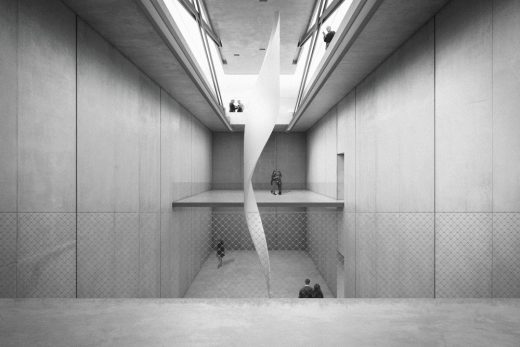 The concept assumes restoration of the building’s original form and elemination of all unnecessary additions. 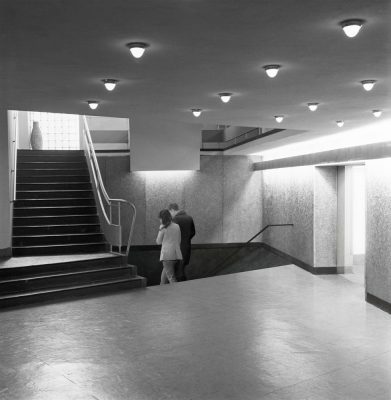 The new exhibition space has been placed underground, underneath the forefront of the existing Gallery. 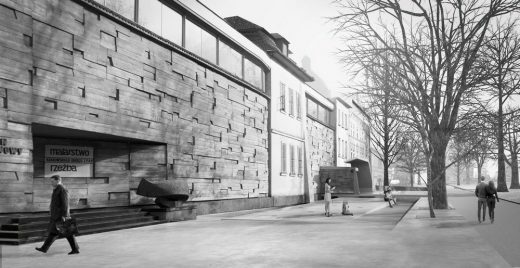 Unlike a superstructure (suggested in the competition brief) it would not affect the inegrity of the original building, at the same time bringing a whole new quality to the Gallery. 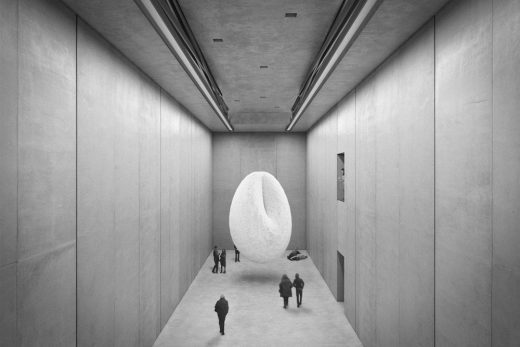 The new exhibition space, juxtaposed with historical gallery, is an ultra-modern “machine” dediacted to presentation of art. Its form is completely subordinate to exhibition purposes. 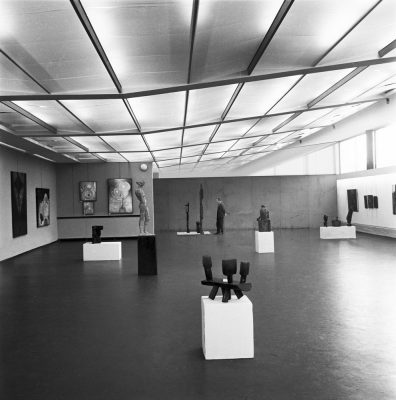 The use of mechanical elements – movable slabs and roof – enable huge variety of exhibition scenarios, impossible in a classical exhibition space. Once the roof is lifted, the new exhibition space also gets a direct connection to the street level, enabling interaction between the Gallery and the surroundings.